616 pages | 275 B/W Illus. 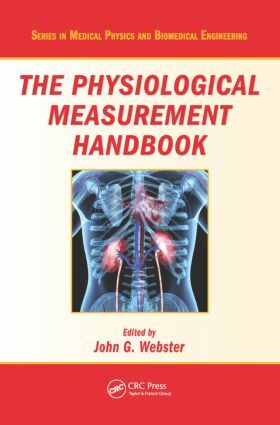 The Physiological Measurement Handbook presents an extensive range of topics that encompass the subject of measurement in all departments of medicine. The handbook describes the use of instruments and techniques for practical measurements required in medicine. It covers sensors, techniques, hardware, and software as well as information on processing systems, automatic data acquisition, reduction and analysis, and their incorporation for diagnosis. Suitable for both instrumentation designers and users, the handbook enables biomedical engineers, scientists, researchers, students, health care personnel, and those in the medical device industry to explore the different methods available for measuring a particular physiological variable. It helps readers select the most suitable method by comparing alternative methods and their advantages and disadvantages. In addition, the book provides equations for readers focused on discovering applications and solving diagnostic problems arising in medical fields not necessarily in their specialty. It also includes specialized information needed by readers who want to learn advanced applications of the subject, evaluative opinions, and possible areas for future study. "…if you are wanting detail about the physiological mechanisms behind commonly encountered clinical tests then this is well worth a read…"
"What makes this book particularly unique and potentially attractive to technically oriented clinicians is the number of chapters organized by medical subspecialty as opposed to simply by organ systems. … this book offers a well-organized and expanded treatment of virtually all of the common and specialty physiological measurements currently available. It should also serve as a good primer for those relatively new to the field." John G. Webster is a Professor Emeritus of Biomedical Engineering at the University of Wisconsin–Madison. He is a fellow of the Institute of Electrical and Electronics Engineers, the Instrument Society of America, the American Institute of Medical and Biological Engineering, the Biomedical Engineering Society, and the Institute of Physics. He has authored and edited numerous books and has been the recipient of several awards. He earned a PhD from the University of Rochester. His research in the field of medical instrumentation focuses on intracranial pressure monitoring, ECG dry electrodes, tactile vibrators, a visual voiding device, and apnea.